I say “touched” instead of “saddened” because although I am terribly sad and thought about Denby throughout the day, I can’t help but think of the joy he brought his family during all the years he lived against the odds, not to mention all the happiness they brought him. I can’t help but think about all the two- and four-legged friends Denby brought together over the years—friends on Facebook who never met in person but who shared joy and comfort in each other’s company, and will continue to do so, all because of a spirited little dog. Every dog touches the hearts of his owners—his family. But Denby reached beyond his “mommy’s” heart and touched the lives of more people than he could count. And so when I remember Denby, I do not dwell on the sorrow of losing him—but rather, I celebrate the joy of having known him and having been part of the community he inspired. As they say—corgi on! Your spirit soared, with soul aglow, through each computer screen. To “corgi on” and be “Denby Strong,” your wink an inspiring grin. You taught us all to enjoy each day of peace and joy and love. And corgi nation’s members, they now feel your spirit above. For years, you crossed impossible bounds, transcending nations and states. Bringing together a world of hounds and people; you’re one of the greats. Now’s your time to soar like angels and kings. There is joy for you, in my tears. And spend your days in the rainbow world, in happy, frappy flight. Be with our pets that have gone before—and enjoy your time to play. During an auction to raise money for Denby earlier this year, I auctioned the opportunity to name a character in the upcoming Corgi Capers: Curtain Calls and Fire Halls. Miss Kat generously won that opportunity, and she chose to name the character Denby, after the inspirational corgi whose stamina and spirit greatly inspired all of corgi nation. In the upcoming book, I created a character that captures Denby’s spirit—spreading joy, enjoying life, and bringing people together. I hope I have done justice to his memory and legacy. 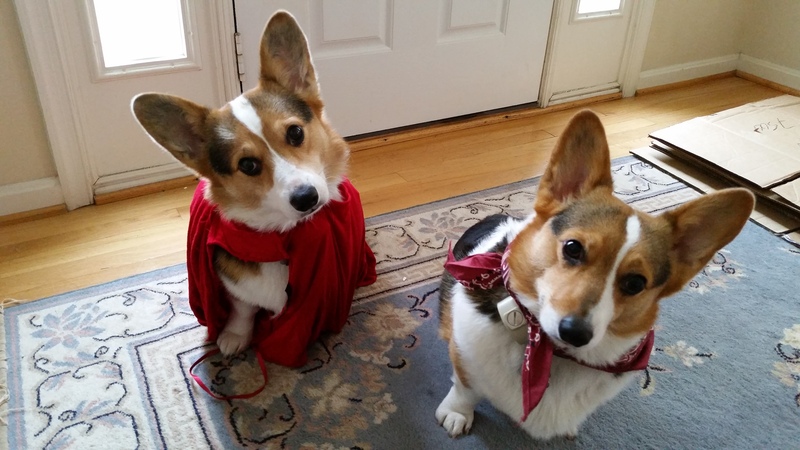 Yoda and Leia, wearing red for Denby. Yoda’s cape is a tribute to the Super-Dog. Posted on October 12, 2014, in character, corgi, corgi capers, inspiration, photo. Bookmark the permalink. 3 Comments. The poem was so perfect. Great job capturing the heightened feelings of the moment. That was very beautiful. I’ve tried to follow your lead and just be touched, but tears stream down my face when I read about Denby’s passing. I’m one of the people he touched. He’s the first Corgi I found on Facebook, he inspired me to create a page for my Corgi to make many Corgi friends, and he reminds me to appreciate every day I have with my Corgis. I already did, but I make sure to make the best of each day. Denby is inspirational and loved by so many. He was a truly special little Corgi. Tears of sadness and of happiness. What an inspirational poem. Just like Denby.